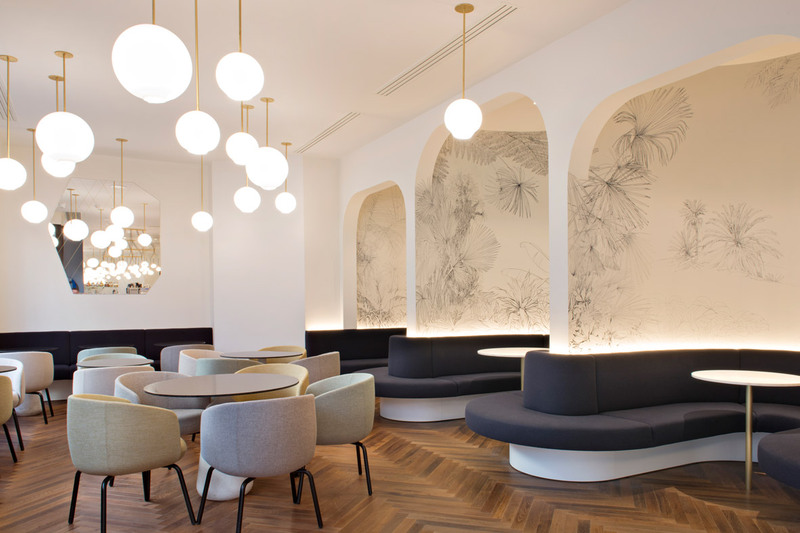 For this sophisticated and elegant salon de the and patisserie in Paris, decorator Diane de Kergal and architect Vincent Eschalier used a selection of SkLO lighting throughout the project. In the sitting area, a composed group of large and small SkLO Float pendants in opaque white glass and brushed brass cover the ceiling. Opposite this, over the custom marble display counter, a SkLO Drape Skirt 15 chandelier, also in opaque white glass and brushed brass, was chosen as a sculptural counterpoint to the colorful selection of artisanal pastry carefully displayed there.